Yes, I am HUGE. Thank you for pointing that out. Today, Tuesday September 22, I had another doctor’s appointment and these babies really are doing AMAZING! The ultrasound tech told me I have a “cervix of steel” and the doctor told me I couldn’t make it look any easier on paper! WOOT! The babies were both measuring exactly a week ahead, little boy was estimated at 4lbs 13oz, and little girl was estimated at 4lbs 8oz. (That is over 9lbs of babies already with 6 weeks or so left to go.) I have gained 30 pounds to this point. I really doubt I will make it all the way to November 4th, the 38 week point that my doctor will not make me go past, but there is no way to predict when these babies will decide to enter the real world. I’m predicting mid-October and my doc said she was fine with that. We want to try to make it to at least 36 weeks which is October 21. As long as they are healthy, I will survive until they are ready. I am having Braxton Hicks contractions almost every night, and my doctor told me to start counting them. If I have 6 or more in an hour for 3 or more hours, I should give her a call. I’m not worried yet as they have not lasted more than an hour. It just means my body is prepping and will be ready to have these babies soon. Both babies are head down and are unlikely to flip again at this point as there really isn’t much room in there. It is certainly possible, but I’m staying very positive and looking forward to a vaginal delivery. I had such incredible and easy deliveries with both of my own girls that I’m confident these two will allow for the same. I am trying to mentally prepare, just in case, for a c-section, but I will be doing everything in my power to prevent it from happening. 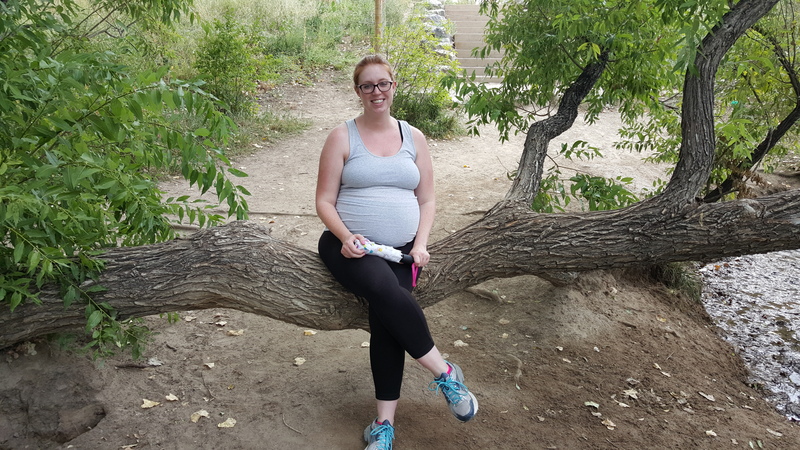 I am not sure why it scares me so much, but I really am nervous about having a c-section. I had a nightmare that my doctor wasn’t on call so another doctor had to deliver me, but told the anesthesiologist to put me under and did a c-section, despite both babies being head down, because he had a tee time to make. I think I’m most nervous about not being able to see my IPs reaction to seeing the babies for the first time. As surrogates, that moment is the reason we do this and to miss out would be really disappointing to me. 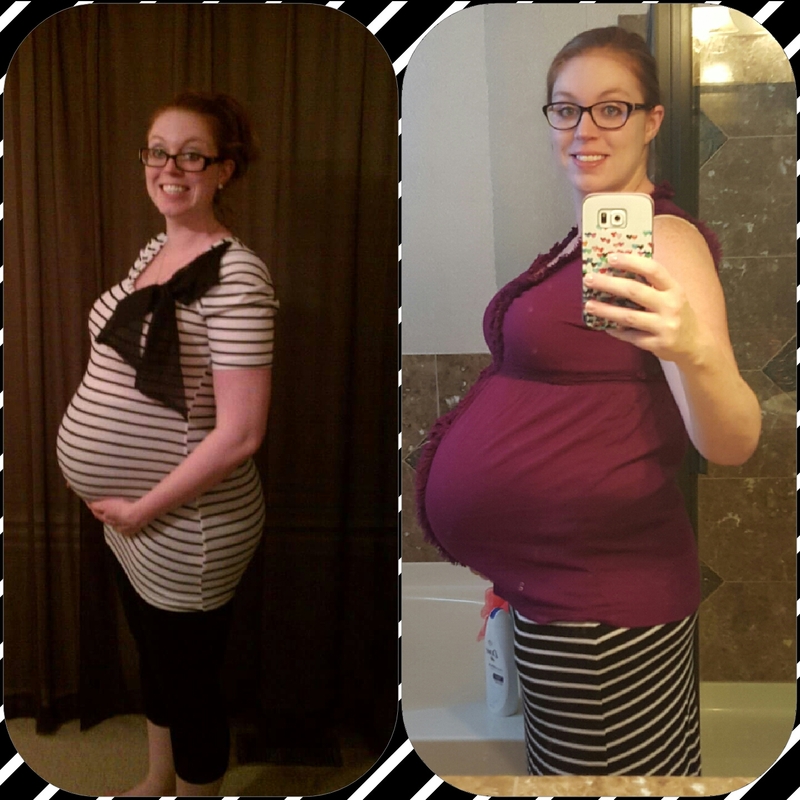 I have already had to come to terms with delivering in the OR, whether or not I have a c-section, because the labor and delivery rooms are not equipped for twins at the hospital I have chosen. This was disappointing as I have arranged for a photographer to be there and she will now not be able to capture that special moment because she won’t be allowed in the OR. I know she will still get some incredible photos from before and after delivery, but now it’s even more important for me to be able to witness them seeing their babies for the first time. I’m just staying positive about everything and I know it will all work out how it is supposed to. 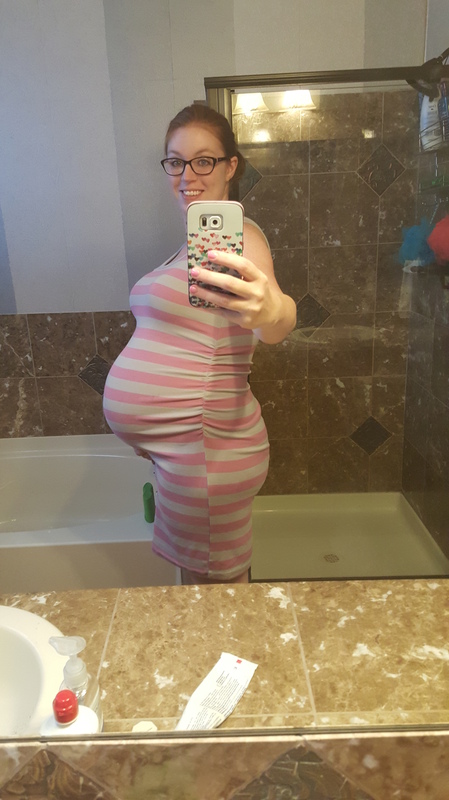 28 weeks 5 days. Taking a rest at the dog park. As far as symptoms go, I am still having some pretty intense pain in my left leg and pelvis. It’s obvious that they are both head down and that both babies are getting bigger because my pain is getting more intense. My husband now has to help me get dressed because I can’t lift my left leg without getting a shooting pain. He has also taken over responsibility for tying my shoes and shaving my legs as I can’t bend over far enough. I get tired more easily each day, but am trying to still walk as much as I can handle. We still take our dog to the dog park we just have to take the shorter trail now. Our dog, Apollo, does great though. He’s really good about waiting up for me and is very protective. 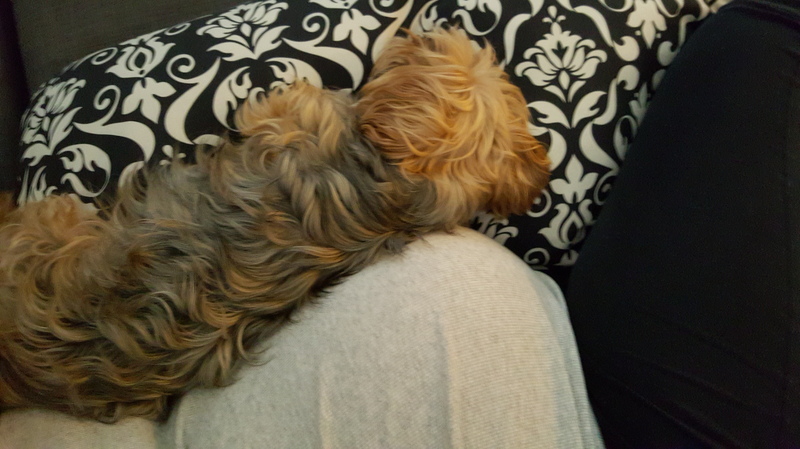 He now also loves to snuggle up to my tummy. I have trouble getting comfortable, especially at night, and have to change positions a lot, but who didn’t see that coming? I knew it was going to be rough at the end with twins, but I signed up anyway. Every ache and pain is SO worth the end result. Being home is challenging. I went from working full time and being in school full time while managing the schedule of my two girls to nothing. I get stir crazy very quickly and can tell I’m getting a little grumpy these days. I am bored and frustrated because I get tired so easily which makes it hard for me to get out and do much. I am still reading (I like the crime dramas), and I play a lot of video games (Destiny just came out with a new expansion that is super fun). 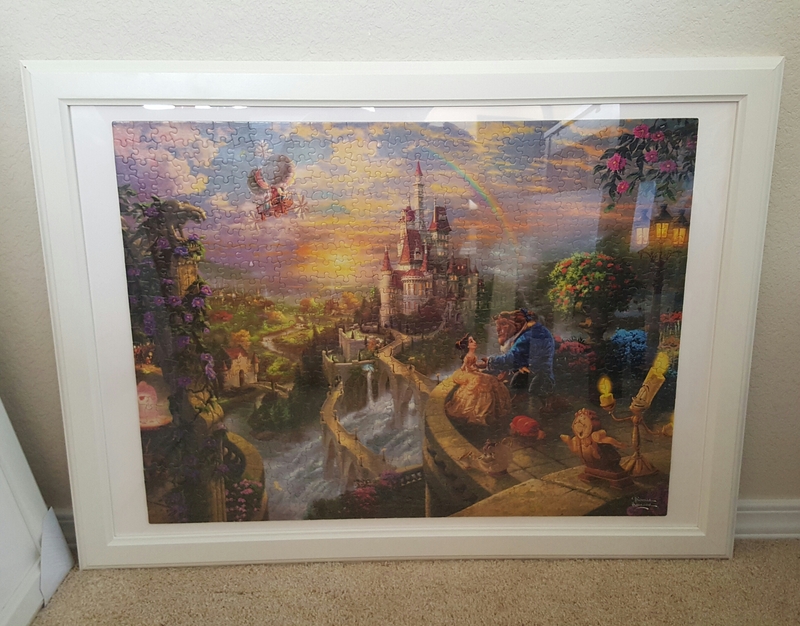 I have also started working on some Thomas Kinkade Disney puzzles that I have framed and will be hanging in my girls’ bedroom. I do love the fact that I have time to help my girls study (my oldest is memorizing sight words for Kindergarten) and I get to read to them more. We will be starting the Lemony Snicket series soon. My husby is great about making sure I’m not doing too much and he’s being very patient with me. I’m so lucky to have his support. We are just taking it one day at a time and trying to enjoy it all because we know it will be over soon. We make it a point to have the nanny watch the girls one day a week so we can have a date day and I can get out of the house. PS….we got maternity photos done and they turned out INCREDIBLE! I can not wait to get them back and share! Such an inspiration. Keep up the good work! Such an inspiration! Keep up the good work!